In him the Old Testament finds its fitting close. He brought the noble line of patriarchs and prophets to its promised fulfillment. What the divine goodness had offered as a promise to them, he held in his arms. – from a homily of St. Bernardine of Siena. From the Oratory of St. Joseph in Montreal. I just love the blues on the card above and the not-quite Art-Noveauishness of it. At the shrine featured in the vintage holy cards. Summer 2011. 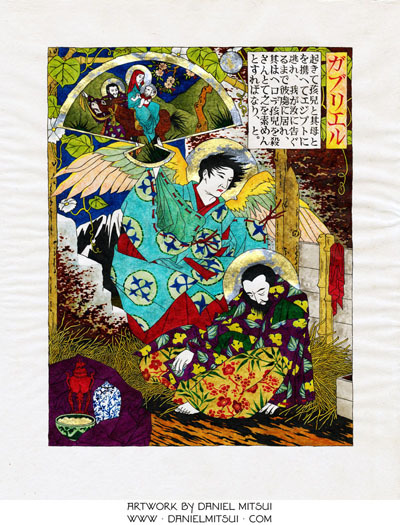 The wonderful Catholic artist Daniel Mitsui, whose depiction of St. Joseph dreaming is above, has a blog. It is an absolute treasure trove of wisdom, whether you are an artist or not. Please go visit, bookmark, visit every day and support his work. Easter’s coming. Surely there’s someone out there who’d appreciate the gift of one his prints? From the Loyola Kids Book of Saints. This morning, we attended the local celebration of the Ordinariate Mass, just begun on a regular , weekly basis. The location is the tiny, historic Holy Rosary Church. 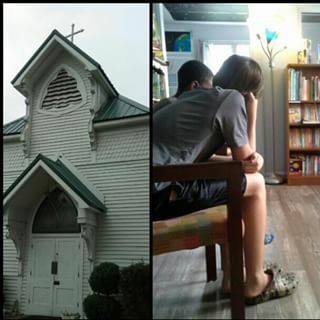 We spent many Monday afternoons there during J’s freshman and sophomore years, volunteering at the parish-sponsored “reading room.” More here about that. The president of Gate City Land Company, Maclin Ross, bought the original property of Holy Rosary for one dollar in 1889 for “Church purposes”. He then deeded the land to Bishop Jeremiah O’Sullivan. This simple church with its hand carved altar was built 125 years ago to accommodate the 80 or so parishioners of that time. The first parishioners were Belgian and Irish, and as the Mark’s Village community continued to evolve Holy Rosary became one of the first truly integrated parishes in the area. The pastor is now Fr. Jon Chalmers, a priest of the Ordinariate who also serves as the president of Holy Family Cristo Rey High School. We had been to Mass there once before – on the infamous Immaculate Conception Snow Day of 2017 when we couldn’t get out of the house until the evening – and Holy Rosary had, I believe, the last Mass of the day, anywhere. But that was Roman Rite/Ordinary Form. When I saw that Holy Rosary was going to start offering the Ordinariate Form liturgy on a regular basis, I made a mental note to try to work it in – between people’s work schedules and the serving schedule at Casa Maria. As it happens, the 10:30 time is really perfect – late enough for the sleepers to get their rest, and not so late that the day feels spent by the time you’re finished. And we don’t live far from the parish – on a Sunday, it takes us 10 minutes to get there. And so we went – there weren’t a lot of us, but there were enough! An organist accompanied on hymns and it was a lovely liturgy – elevated language, raising the heart and mind to worship, but not stiff or wooden. What is interesting to me – and would be striking to anyone, I think, on first exposure to this liturgy – is a greater penitential emphasis and tone than one finds in the contemporary Ordinary Form. It’s not at the level of Eastern Catholic liturgies, where you’re saying Lord Have Mercy more or less constantly throughout, but it’s definitely noticeable. Which means – if you’re noticing it, you’re noticing your need to repent and open yourself to God’s mercy – always a good thing. And, of course, we have our ad orientem celebration, inexplicably terrifies and enrages some, but you know – which actually makes so much sense. As the celebrant prays to God, he faces in the same direction as the rest of us, and then in dialogue, he turns to the congregation. Note: you might have expected the vestments to be purple, since it’s Sexagesima Sunday. But the Feast of the Chair of St. Peter was on 2/22 – and that’s the Ordinariate’s patronal feast – so it’s celebrated on the closest Sunday. So, white. Today is the feast of the great martyr bishop who was also a disciple of St. John the Evangelist. Here is the old Catholic Encyclopedia article on him, which includes, of course, information on the sources for his life. Here’s a translation of the “Acts of Polycarp” – the account of his martyrdom sent from the Church in Smyrna. He is in my Loyola Kids’ Book of Saints.